Imagine a city of 50,000 people. A city whose entire population in the course of one evening had to abandon their homes. Forever. 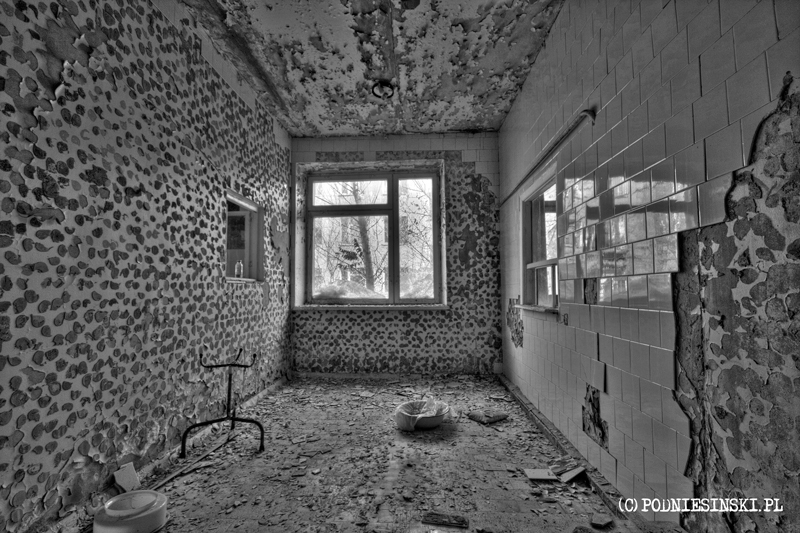 Welcome to the City of Ghosts – Prypiat and Chernobyl. 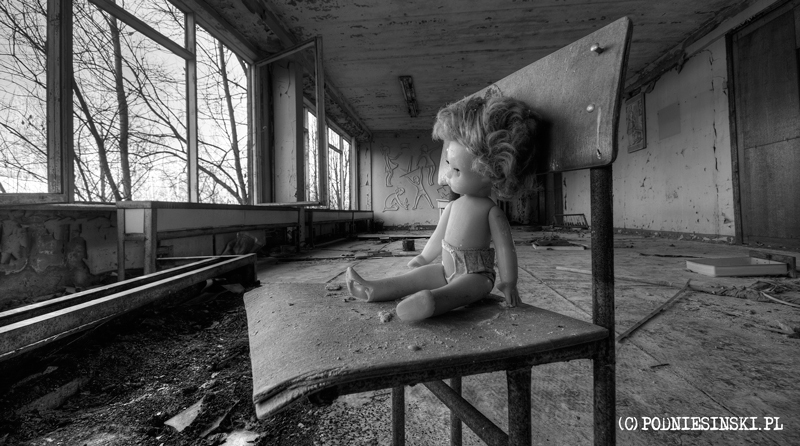 First a few words about Chernobyl and the catastrophe itself. On April 26th, 1986, the greatest catastrophe in the history of nuclear power took place. Overheating, partial rusting of the reactor and a hydrogen explosion occurred as a result of a failure of the cooling system. This caused radioactive materials from inside the reactor to be discharged directly into the atmosphere and area surrounding the plant. As a direct consequence of the catastrophe, 30 people died, over 200 became ill with post-radiation diseases and in a 30 km radius around the power plant, over 130,000 people were evacuated creating a closed protective zone. The indirect and long term effects of the incident are still unknown to this day. And it is safest to have a Geiger counter with you and have it switched on the whole time. 1 roentgen (R) =1000 milliroentgens (mR) = 1000000 microroentgens (uR). The average radiation in a normal city is 15 uR/h. The average radiation in the zone varies between 50 and 500 ur/h. It is assumed that a small, safe intake is one that does not exceed 100 mR/year. A lethal intake is approx 500 R/h in approx. 5 hours. Those who can do quick sums can convince themselves that even despite exceeding the dose by a few dozen times, a stay in the zone is relatively safe. But the most important criteria besides radiation level is time. Therefore, staying in the zone for a relatively short time should not exceed the safe annual dose which each of us ingests normally. At least in theory. However, there is still the ubiquitous dust that can contain radioactive particles. Therefore, it’s also worth taking a special protective mask with you. Getting to the zone requires obtaining special permission. 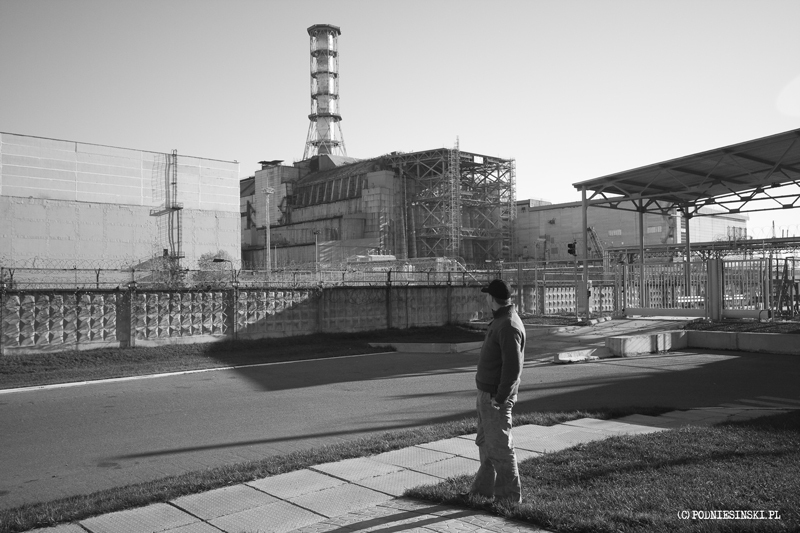 The first place we had luck with was the power plant itself and reactor no. 4 in which the incident happened. Currently, the reactor is covered by a special concrete sarcophagus which limits the flow of radiation. The durability of the sarcophagus was calculated as a few dozen years and so it is necessary to build another, even larger one which will cover the former one. The current sarcophagus threatens at any moment to collapse and cause more radiation to leak out. Allegedly, work on the sarcophagus is meant to begin next year. This is therefore the last possibility to view the power plant. After a moment, the Geiger counter starts to screech dangerously-signalling that the radiation level is too high (500 uR/h). So we retreat to the car and drive away. You shouldn’t stay here too long. 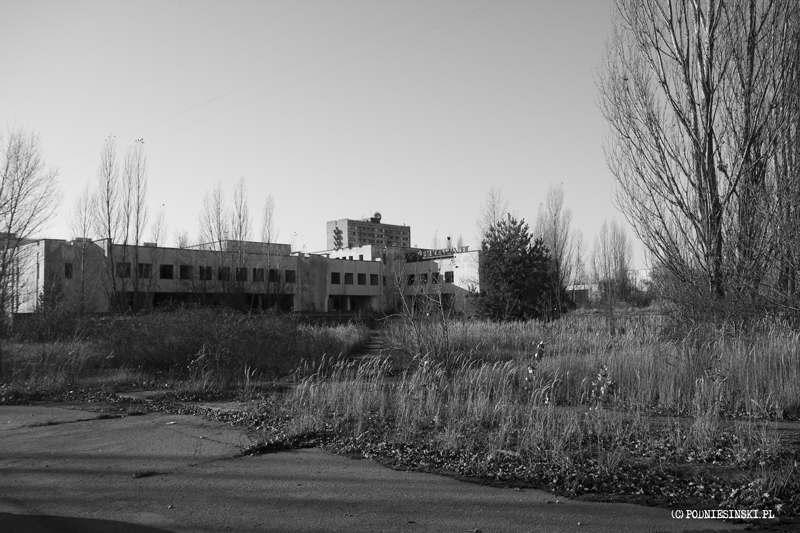 Our main goal is the abandoned city of Prypiat. Along the way we pass the so-called Red Forest, a place where no one dares to enter. After the explosion, the largest cloud of radioactive dust went through this very region. In one moment all the trees turned red and stayed red. They were later buried and in their place, a new green forest is growing. Radiation, however, cannot be buried. 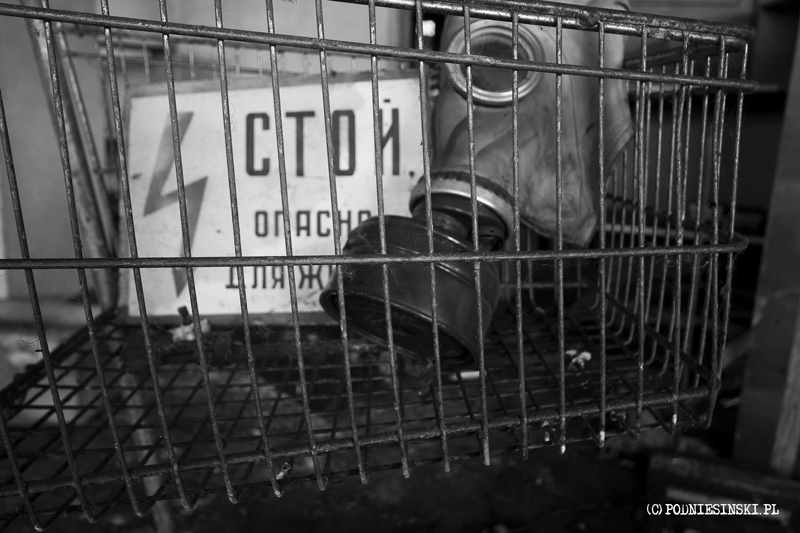 The radiation level continues to qualify this place as one of the most toxic places on earth. We don’t stop there, but the Geiger counter howls like mad. 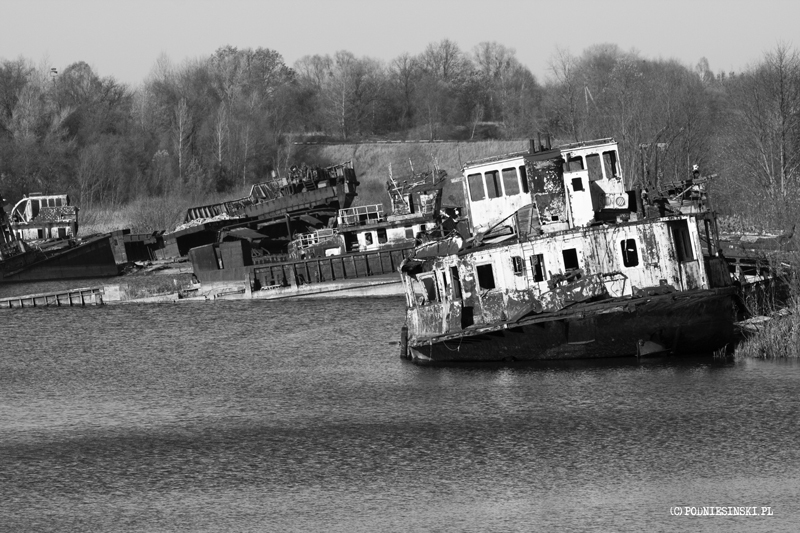 On the way we stop again by the river where we see abandoned, half sunken, rust-eaten ghost ships. They have been so exposed to radiation that they cannot be used. 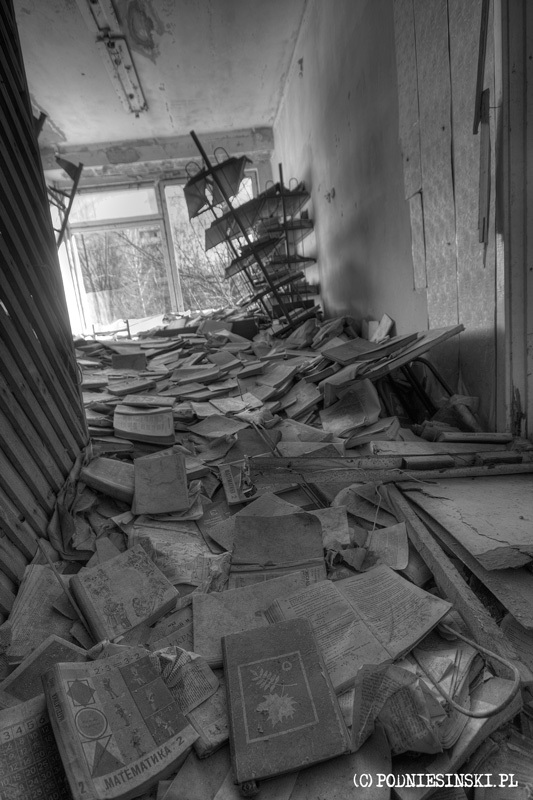 Prypiat, once a city of almost 50,000 people, now abandoned, often called the City of Ghosts. Built especially for workers of the power plant and their families, it lies only 3 kilmometres from it. 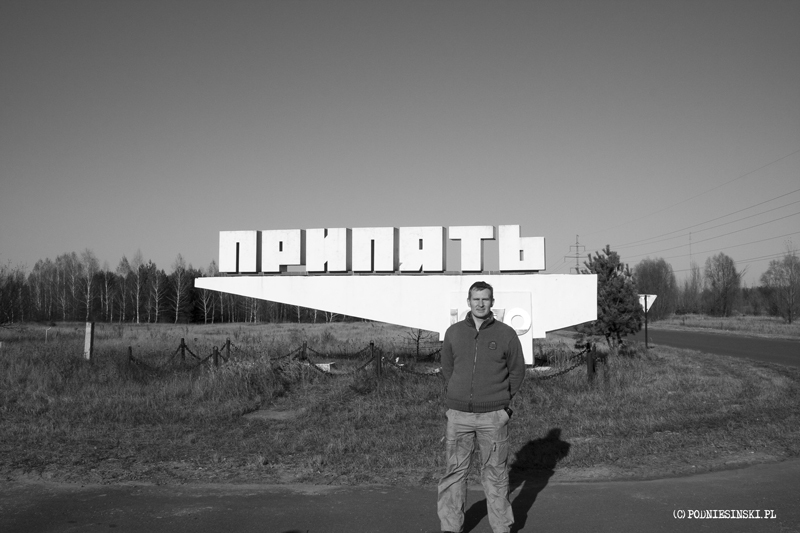 The city, at the time part of the USSR, is very young- it was established in 1970. It consists essentially of only buildings and housing blocks made of so-called panels. Blocks of the sort found on many Polish housing estates only many times bigger. Only 36 hours after the explosion, the decision was made to evacuate the city. 36 hours too late. For the sake of a quick and efficient evacuation, residents were lead to believe that the evacuation was temporary. That they would return quickly. And so no one brought their belongings with them. Over the course of a dozen or so hours, thousands of people were evacuated from the city. The column of 1125 buses leaving the zone was over 20 kilometres long. The city ceased to live. It died. Entry to the city is only allowed by showing a special permit. Passing the guardhouse, we see a clock showing the level of radiation – 54 uR/h. Not bad. We’re also getting used to the fact that the ubiquitous clocks tell the level of radiation instead of the time. A moment later we are at the city’s main square. The city centre. On one side there is a store, hotel, cultural centre, behind that the amusement park and there are residential buildings everywhere. The first thing we notice is the fearful emptiness and silence, broken only by the whisper of trees. A rare view – only buildings all around and not a single living soul. Supposedly somewhere in the area there live two people in their 80s who, for unknown reasons, managed to return and re-settle in the city. They would rather risk their health and even life than risk abandoning the city. After all, where would they go? They are old already. They have resigned themselves to it. It’s not easy to encounter them, or the rest. Strange in a city where once almost 50,000 people lived. At first sight, the city looks like any other. Walking through it, we have the impression that someone will suddenly walk out from around the corner, drive by in a car, turn the Ferris wheel. That suddenly a child will go back for a teddy bear left on the Ferris wheel. Thousands of windows are open all around but no one is behind them, you can only hear the wind. And silence. Sometimes infuriating. Others say deafening. We start our stroll through the town from the entrance to the roof of the tallest building in the city. We quickly conquer the 16 floors and stand on the roof as if hypnotised. It is an unusually moving view. The whole city, clear as day, and in the distance, the reactor- the reason for the exodus of thousands of the city’s residents. After a while we decide to go into a few buildings. Most of the valuable objects have been lost from the interior. For over 20 years, looters have been doing their work and most of the stolen items soon appeared in the consignment stores and markets of nearby Kyiv. From the lesson books and cards lined in red with grades we conclude that the next room we are in is the teachers’ room. We see the books with names and grades of students who had to prematurely end their education at this school. 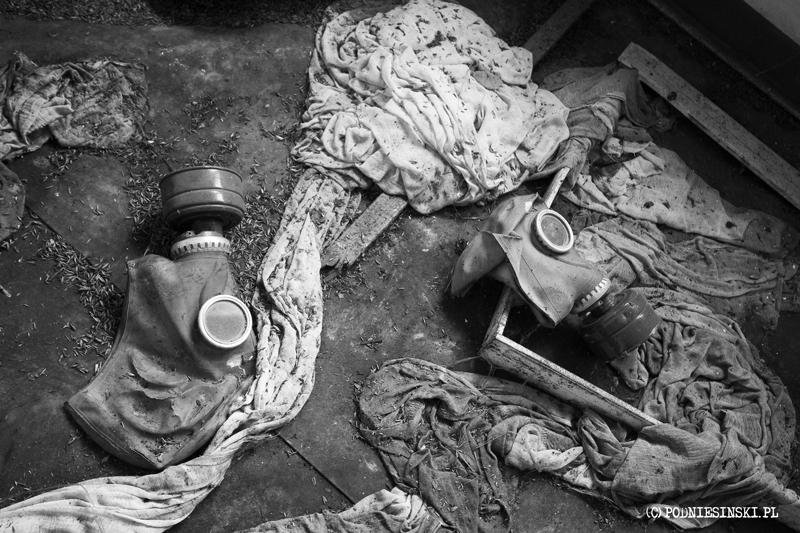 In the next room, we see scattered gas masks. Their strange small size grabs our attention. We figure it out right away-they are for children. The next room is the music hall. 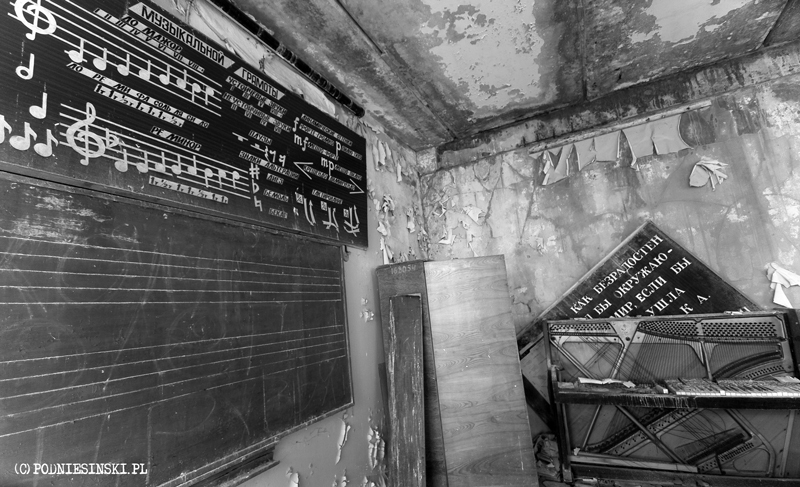 Staffs, a ruined piano, workbooks everywhere. Leaving the school, we go to the gymnasium. The old, decayed floor makes it impossible to walk around the hall safely. The basketballs lying around everywhere grab our attention and to the side, the podium on which someone was once declared a winner. After the school, we visit the hospital. Everywhere you can see scattered medicines, test tubes, prescriptions and many different pieces of medical equipment. 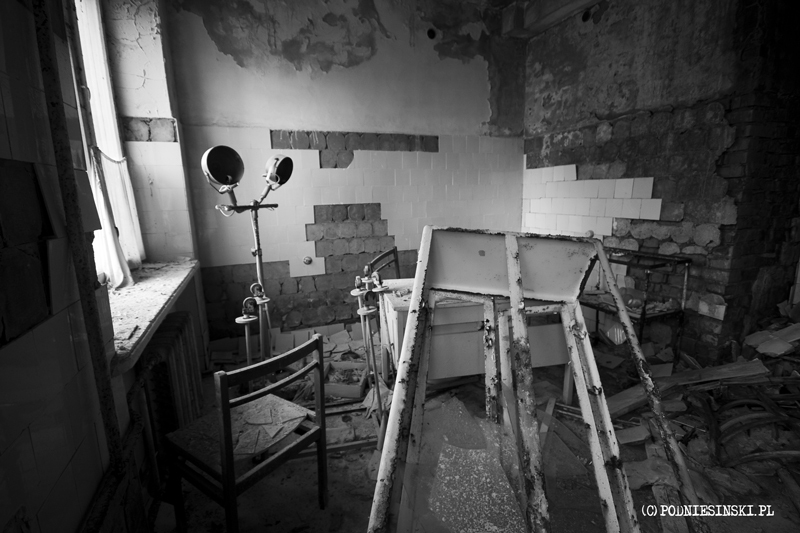 In one room, the remains of a delivery room bed and outside, a gynecological bed. 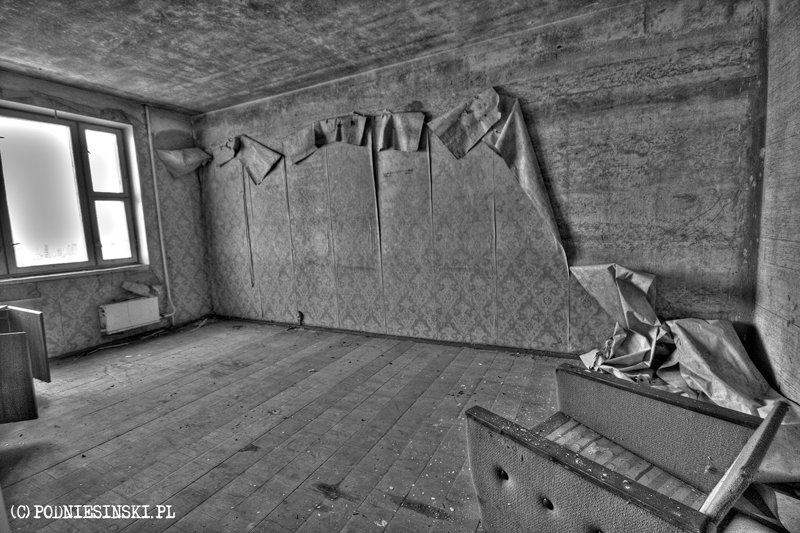 In some rooms you can see whole walls with the tiles scraped off. Tiles are a commodity – they could be sold. 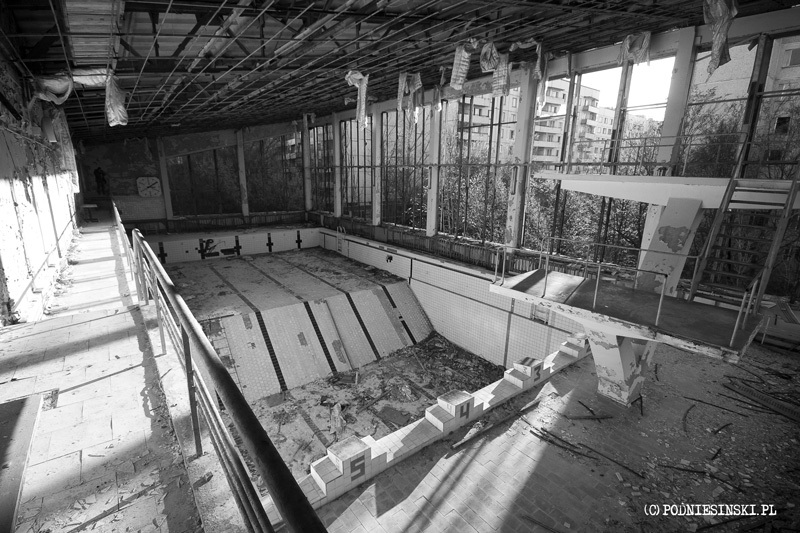 The pool – huge, with a diving board. At the bottom of the pool we notice there is still a paddle lying there. A large concert hall in the music school. A piano on the stage. Dusty, with some damage but still in working order. We wonder why no one has stolen it yet. Was it too big? 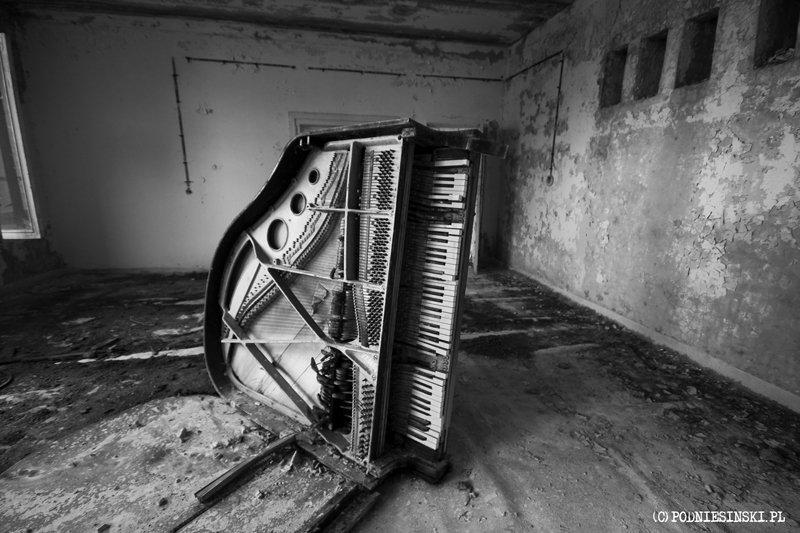 On the floor above, another piano, on its side. Maybe someone tried to lift it? 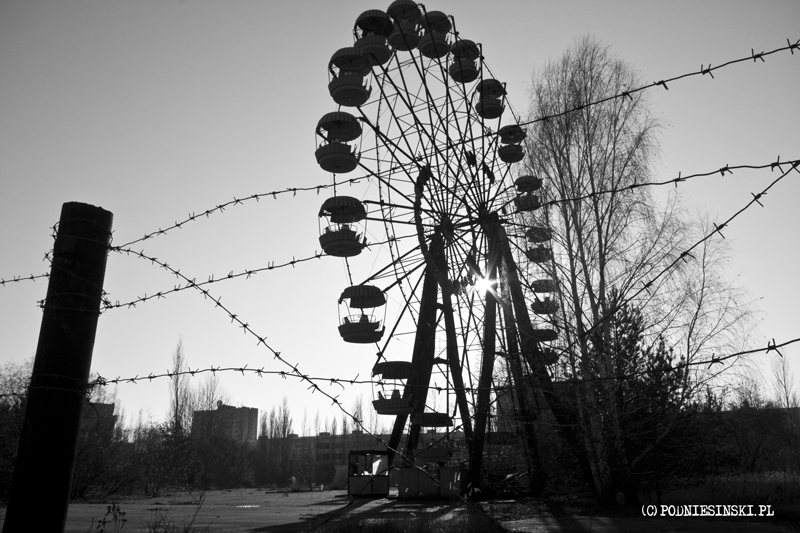 In the evening, we return to Chernobyl where we will spend the night. The current radiation level in the town is normal, nothing different from the average in Poland. But it’s difficult to sit in one place, so we decide to see how the town looks at night. The warning from the passing military patrol about gangs of wolves and wild boars wandering around not only in the nearby forests but also in the town does not discourage us. We continue. 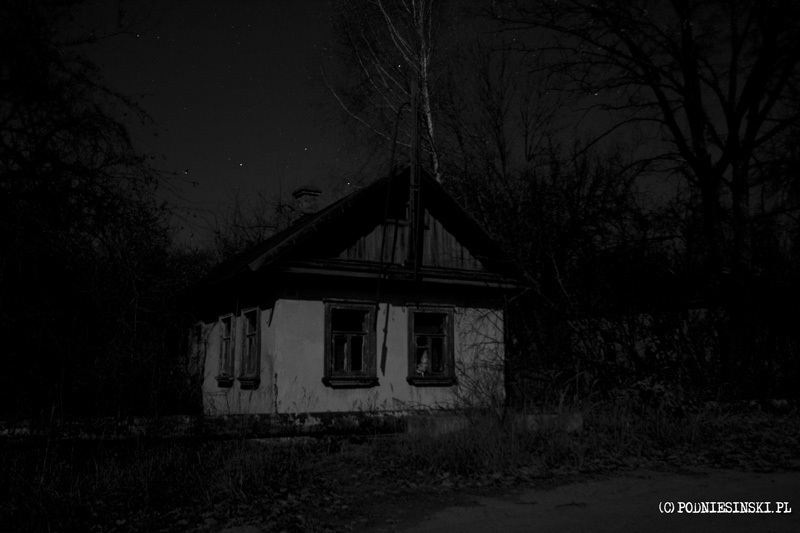 At night, the scattered houses look even worse, ghastly. (It gives us the creeps, but mainly because we’ve gotten lost). The whole next day we spend in the City of Ghosts and in the afternoon we leave the city. 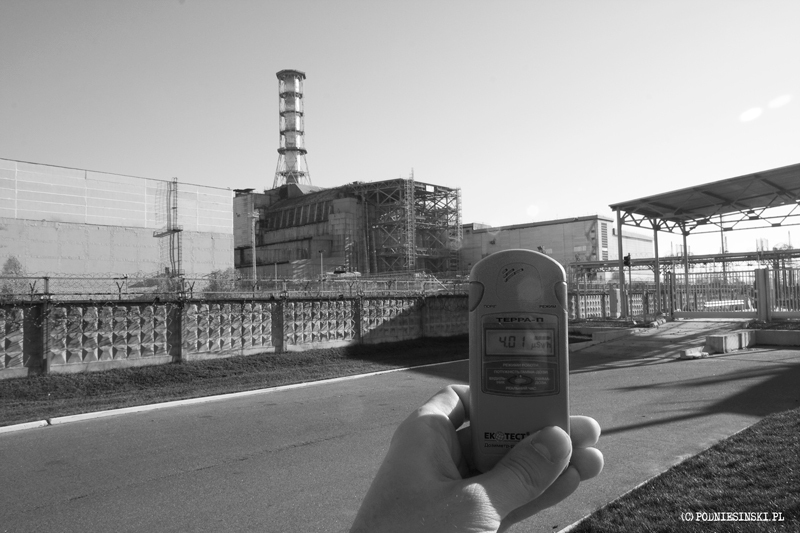 On leaving the zone, there is another compulsory radiation inspection. We get out of the car and go to a special room where special machines check that we have not been contaminated. In the meantime, other soldiers check that our car is also clean. Fortunately, everything is okay and we can leave the zone. An immense experience, not comparable to anything else. Silence, lack of cries, laughter, tears and only the wind answers. 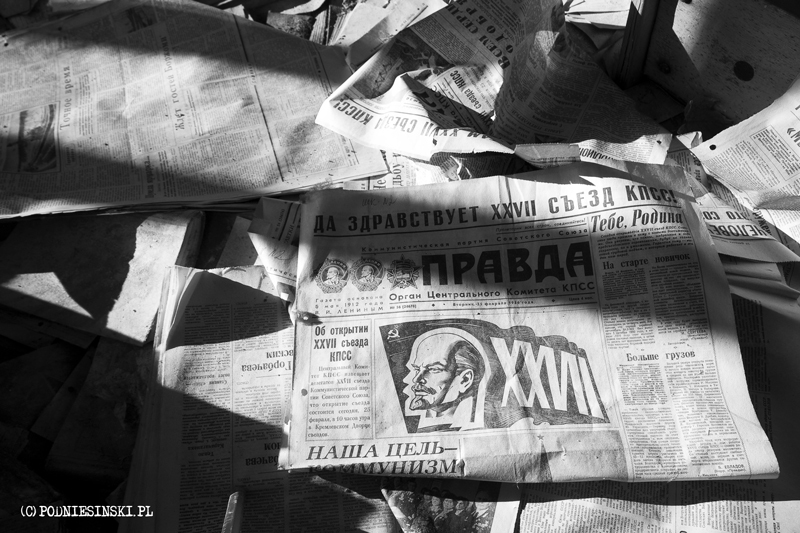 Prypiat is a huge lesson for our generation.